Manda's Mind Meltdown: Time is ticking away! I have LESS than five complete days until I leave for Dallas! I thought for sure it would take longer than this to get here. Do you remember the days when it felt like a month to move a week??? Well, I think I've found hyperspeed!!!!! It feels like it should still be July, NOT mid-September!!!!!!! I have so much to do...I haven't started packing, still have a quilt to finish, still getting orders, UGH!!!! My poor family is turned up on its ear. 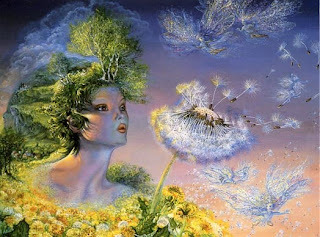 This image is by one of our favorite artists, Josephine Wall...this one is called, of course, "Time Flies". The boys had a WONDERFUL time at the Gulf of Mexico. Due to the heat and water, we didn't get many pictures, but the boys are talking about it anyway!!!! Aren't they just adorable in my sun hat!!!! I think they are accepting the two month stint away better than Bob or I! !